TMJ treatment can be a confusing topic, especially when dealing with chronic pain. At TMJ & Jaw Surgery Clinic, we aim to offer a variety of treatments to suit different stages and sources of temporomandibular joint disorder. Although we are proud to provide world-class TMJ surgery, we also offer non-surgical treatment options in order to provide you with the best possible choices. Every patient is unique, so we are dedicated to finding the TMJ treatment that works for you. A specialised TMJ splint is often a crucial step in managing TMJ disorders. Splint therapy uses custom 3-D printed or CAD-CAM produced appliances to stabilise and unload the temporomandibular joint. It's a lot like a mouthguard - but instead of preventing injury, it prevents tooth grinding and clenching. A splint is uniquely fitted to the individual patient's jaw and symptoms, then adjusted over time to maintain efficacy. Although not all patients will find that a splint is effective, others will enjoy significant relief. If your TMJ pain is primarily due to muscle strain, or habits like tooth grinding, a splint has a greater chance to be effective. In some cases, the splint is sufficient treatment on its own, and the patient can avoid further procedures. The affordability of a splint, compared to many other treatments, also makes it an appealing TMJ treatment option. If muscle tension contributes to your jaw pain, Botox is a potential TMJ treatment option for you. You may have heard of Botox as an anti-wrinkle treatment, where it's effective because it can relax facial muscles. In the same way, injections of Botox into the chewing (masseter and temporalis) muscles can relax these muscles, helping to relieve TMJ pain. Botox injections are a reversible, non-surgical procedure that may be beneficial in treating TMJ disorder. Depending on the cause of your TMJ pain, this treatment can offer temporary but long-lasting relief. Inflamed or impacted teeth can contribute significantly to TMJ symptoms. For example, an impacted (not fully emerged) wisdom tooth can often cause difficulty in chewing or closing the jaw. 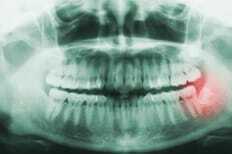 Teeth might also cause jaw pain when they are badly decayed or infected. In these cases, your TMJ dentist may recommend removing the offending tooth. Nobody enjoys the idea of tooth extraction! However, our oral surgeons specialise in removal of these teeth with precision and care, minimising the risk to adjacent teeth, bone and nerves. Our expertise ensures that the process is as gentle as possible. Dental implants are an effective way to replace missing teeth. If your TMJ disorder is related to jaw misalignment, dental implants can help to ease strain and restore normal function. If you are missing one or more teeth, you might naturally favour the stronger side of your jaw. This can lead to a misaligned bite, which puts undue strain on certain teeth and related muscles. Over time, this can develop into pain, stiffness and abnormal jaw function. Placing an implant is the first step to restoring a healthy, comfortable bite. The implant itself is a titanium post, which your TMJ dentist will place into the jawbone. After integrating into the bone, the implant acts as an anchor for an artificial crown, bridge or denture. This creates a permanent replacement for the missing tooth, allowing the dentist to bring your jaw back into alignment and, ideally, restore normal function. At TMJ & Jaw Surgery Clinic, our goal is to find the right TMJ treatment for every individual patient. If you need relief from TMJ pain and dysfunction, you can trust us to deliver an effective treatment plan that meets your individual needs. For effective and affordable TMJ treatment, contact TMJ & Jaw Surgery Clinic today!